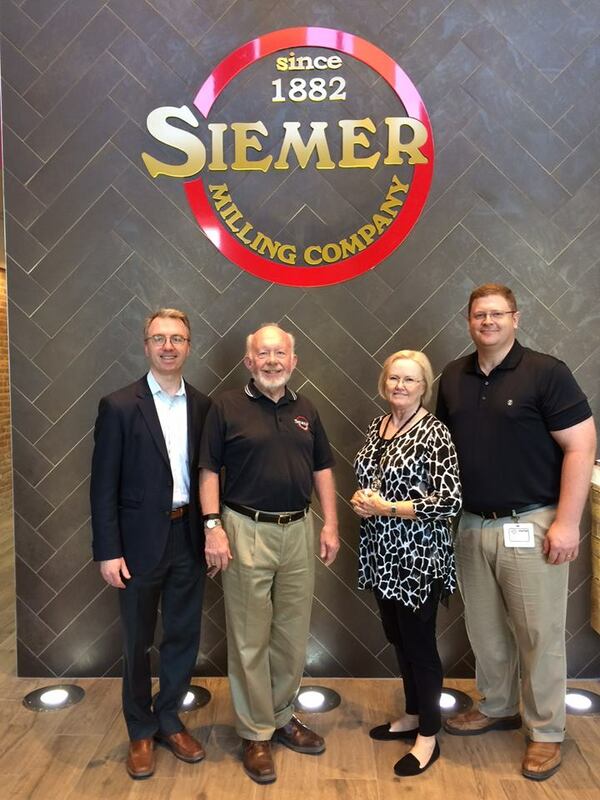 Chris and Dale of NAMA (North American Millers' Association​) stopped by our mill in Teutopolis, Illinois​ today to get an inside look at our operations here at Siemer Milling Company​! The NAMA represents the milling industry with the federal government and Congress. One of their primary goals is to ensure that our nation has a plentiful supply of top quality grains, produced in the most efficient, sustainable and safest way possible. The NAMA also plays a vital role in delivering nutrition to American consumers, as well as providing nutritious grain-based products to help feed those around the world. Foods made from the flour, meal and oats milled by NAMA members are important components of a healthy diet. Complex carbohydrates in grain-based foods provide essential fuel for the body while both whole and enriched grains are good sources of key nutrients, vitamins and fiber which can help prevent disease. The NAMA is proud to be the indispensable link between the raw grain and the healthy, good-for-you products that have sustained and enriched people’s lives for centuries.